Nature Alive has a large population of Great Crested Newts, a protected species that has declined greatly in the UK in recent years due to the loss of suitable habitat. The ponds on site also support smooth newts, common toads, common frogs and numerous other aquatic invertebrates such as dragonfly larvae and water beetles. Wetland plants including common reed and water forget-me-not provide foraging, egg laying and refuge areas for newts and other wildlife. The surrounding tall grassland and scrub provide excellent hibernation and refuge areas for both amphibians and small mammals. The ponds are managed to ensure that conditions continue to be suitable for the amphibians to breed and regular surveys are carried out to identify and record species found on site. It is as early as February when newts will leave their winter shelter on land to pair off in the water to breed. The female will lay between 200-300 eggs which will take around 4 months to develop into small young. During this time their lungs develop internally and they lose their external gills. They are then able to leave the pond to find a damp place to hibernate. A frog has a smooth, slippery skin and toads have a dry and warty skin. Toads tend to crawl or hop rather than jump and they have shorter and less powerful back legs, frogs leap and have powerful legs to do this. Frog spawn is laid in clumps, toads lay eggs on long strands. Frog tadpoles are brownish in colour, toad tadpoles are jet black. Compare the differences between frogs and toads from the pictures below. The image on the left is of a common frog and the one on the right is a common toad. Water Voles are semi-aquatic rodents known to many as a 'Water Rat' or 'Ratty' just like the one in the book 'The Wind in the Willows' and a small number live in and around the ponds at Nature Alive. They are a protected species and now one of Britain's most endangered mammals. Water voles are expert swimmers and divers and excavate extensive burrow systems into banks of the waterside which consist of their sleeping and nesting chambers at different levels and include an underwater escape route should danger threaten. Water voles tend to be more active during the day than night and generally eat grass and plants close to the waters edge and occasionally fruits, twigs and roots. You may spot evidence of piles of chopped food / vegetation surrounding the entrance to a burrow. 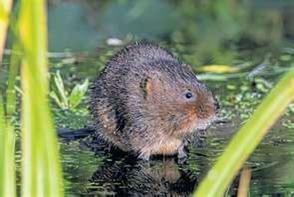 Water voles usually have 3 to 4 litters a year, if a mild spring, the first to appear in March or April. There could be up to five young in a litter, and although born blind and hairless they grow and mature quickly. 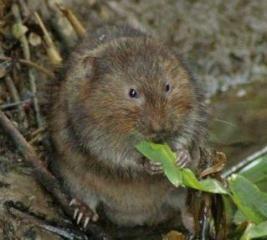 On average a water vole may only live up to 2 years in the wild. They have many predators including mink, stoats and herons. Even brown rats, barn owls and pike have been known to take them. Rat sized with a blunt nose, chestnut brown fur, short rounded ears and a long hair covered tail. Urban Forest Park occupies approximately 7.7 hectares of land within the centre of Coalville. The site is relatively flat but with the importation of soil a number of low mounds were created. The planting of approximately 3.5 hectares of new woodland and the establishment of grassland followed. Many of the tree and shrub species planted on site can be identified below. Woodland mix - Alnus glutinosa (Common Alder), Betula pubescens (Common White Birch), Fraxinus excelsior (Common Ash), Populus x canescens (Grey Poplar), Larix kaempferi (Japanese Larch), Pinus corsica (Corsican Pine), Quercus robur (English Oak), Crataegus monogyna (Hawthorn), Ligustrum vulgare (Common Privet), Prunus spinosa (Blackthorn) and Salix caprea (Goat Willow). Wetland mix - Alnus glutinosa, Alnus rubra (Red Alder), Populus canescens, Cornus sanguinea (Dogwood), Salix caprea and Salix fragilis (Crack Willow). a quiet, unobtrusive small, brown and grey coloured bird often seen on its own, moving with a rather nervous, shuffling gait often flicking its wings as it goes. It eats insects, spiders, worms and seeds. It inhabits well vegeatted areas of scrub, brambles and hedgerows. a bird with a mix of brown, black, white, orange and cream coloured feathers, with a black/dark grey beak. A familiar and popular garden bird whose numbers are declining. The Song Thrush is a ground feeder and enjoys eating worms, snails and fruit. The males live up to the name but confusingly the female birds are brown in colour often with spots and streaks. It has a bright ornage/yellow beak and a yellow eye ring making the adult male blackbird one of the most striking garden birds. commonly encountered as a winter bird it is the UK's smallest true thrush. Wuith a creamy strip above the eye and an orange - red flank patches make it distinctive. It feeds along fields and hedgerows on worms nad berries. Migrants arrive in September, most in October and November and leave the UK again in March / April.